This story features Sherlock Holmes, but focuses much more on his niece and her best friend, who is related to vampire author Bram Stoker. The girls spend their time solving mysteries and staking vampires, which is awesome in itself, not to mention the story has a cool steampunk atmosphere, time travel, and multiple perspectives. At its heart, though, the story’s greatest strength is its characters and plot. Another story with great characterization is The Spy in the House. Unlike many girls in Victorian era books, Mary Quinn isn’t rich and doesn’t live in a fancy house, so she feels a lot more honest than some portrayals of girls in the time period. She also has an admirable sense of justice and is incredibly smart and resourceful, like any girl detective. The best part by far of this Holmes-inspired book is the realism. Ingrid, the 13-year-old protagonist, must solve a crime…while still going to soccer practice, attending theatre rehearsals, and doing math homework. She also has friends and enjoys fun stuff like riding her bike and sleepovers, like any other young teenager. Of course, she practices deductive reasoning in her spare time, which sets her apart a little bit. This book follows Sherlock Holmes when he’s about 9-12 years old, making it more of a middle grade book, but it’s definitely written with as much detail as most teen books. The story gets a bit heavy in parts, which makes it all the more meaningful, plus there’s amazing imagery and, of course, some cool deduction stuff. In this story, 10th-grade scholarship student Chanti Evans must solve a mystery at her new prep school. Unlike many teen mystery characters, Chanti is funny and relatable, with the same sorts of teen issues normal girls have. If you’re looking for a light-hearted mystery book, you will love My Own Worst Frenemy. This book combines London’s mysterious atmosphere with a hilarious narrator and ghosts. Yes, ghosts. A little out of the “realm of reality” that Sherlock Holmes is in, but the London location makes it somewhat reminiscent, not to mention the plotline has a somewhat historical basis. There’s a bit of romance and friendship in there too, as well as a somewhat diverse cast of memorable characters. Having gone to London the summer before I read it made it even better, because the author knows the location somewhat well. Reston readers may be excited to hear that this bestselling book takes place in Virginia! Southern Virginia, yes, but Virginia nonetheless. Plus there’s some government intrigue D.C.-area teens will love. I can’t say much more without giving away the plot, but trust me: You will likely be up all night reading this book. What makes Terrier unique is that it combines a mystery with plenty of fantasy elements and fascinating characters. The main character, Beka, has a special connection to animals and must investigate a crime involving magical artifacts. The book is written in a diary format and includes an appendix with plenty of world-building information, perfect for fans of both fantasy and mysteries. Dalton, a sarcastic, witty, and kind-of-cheesy protagonist, goes to a new school in order to solve the murder of a popular student. 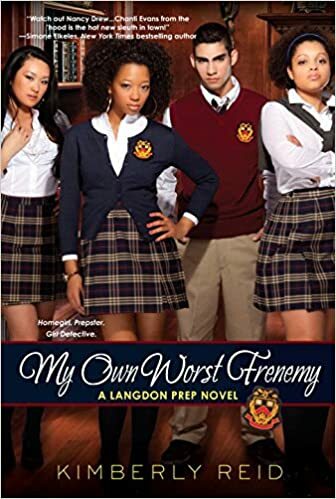 With completely hilarious and over-the-top high school tropes and a goofy appendix/glossary explaining Dalton’s personal jargon, Beaudoin is one of few authors to incorporate serious world-building into a supposedly realistic story.